A good UI is an important part of the development experience. The MongoDB Shell works great for administrative actions, but when working with larger amounts of data, the UI becomes fairly important. In 2014, we discussed 4 of the top MongoDB GUIs: MongoVue, MongoHub, RockMongo, and Robomongo. We left those at the end of this post for your review. Since then, however, many new options have emerged and we thought we’d share our updates. 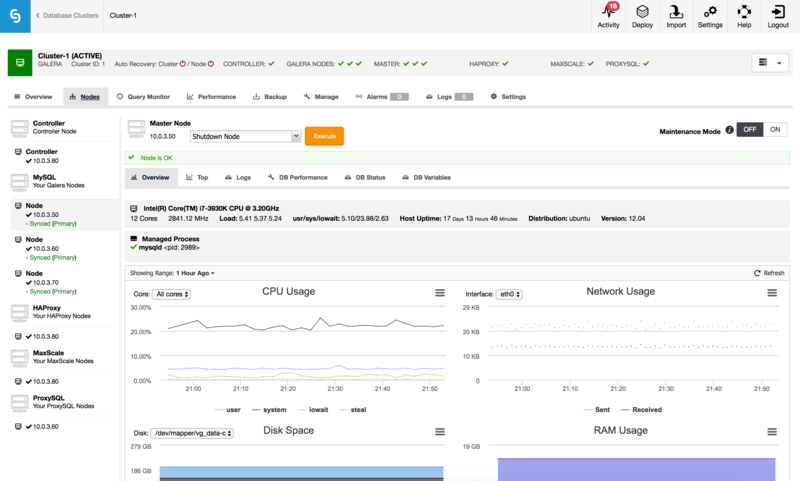 In this article, we are going to compare 4 of the top MongoDB User Interfaces that help developers increase their productivity and manage their database. We’ll be focusing on data visualization, presentation, and editing. As always, your mileage will vary depending on your scenario and preferences. 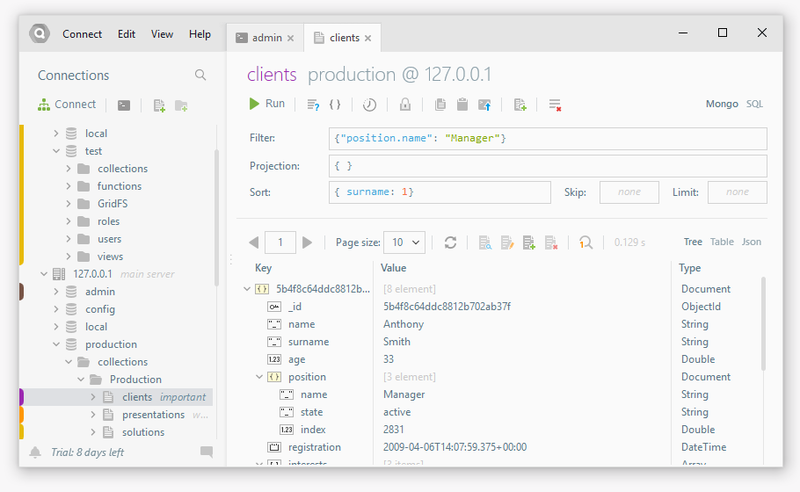 Read on to find out which is the best MongoDB GUI for you, updated for 2016. It provides users with a graphical view of their MongoDB schema without requiring the use of query language. In MongoDB, collections do not enforce a rigidly-defined document structure. This can make it difficult to explore and understand the underlying data and its structure without a tool like MongoDB Compass. MongoDB Compass analyses your documents and displays rich structures within your collections in a simple and intuitive GUI. It allows you to quickly visualize and explore your schema to understand the frequency, types, and ranges of fields in your dataset. 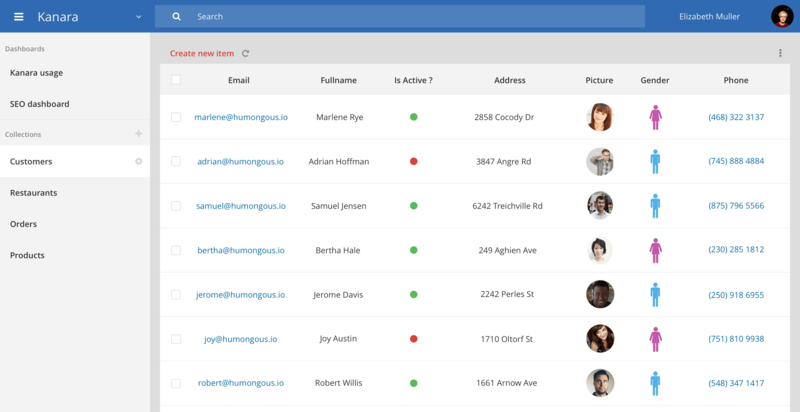 Note: While the UI looks slick, it is neither a full-featured development UI or a full-featured BI tool to mine your data. Will be interesting to see in which direction it will proceed. Note: Full featured commercial grade development UI for MongoDB. Development was stopped for a long time due to funding issue but it appears to be back on track now. Platforms: Mac OS X, Windows, Linux Pricing: Free Community Edition, other versions start at $12/month billed annually. Studio 3T is another preferred tool for developers to work with MongoDB. Whether you’re exploring your local database or working with shards and replica sets, Studio 3T allows you to do all of it. Studio 3T helps thousands of MongoDB developers and administrators with their everyday jobs by providing the finest MongoDB tools in the market. The Studio 3T Shell provides effortless multi-line editing and auto-completion – including of course database and collection names. Creating complex update or aggregation queries is a breeze. Studio 3T Shell output is fully formatted, highlighted and searchable. A complete command history is also available. Pricing: Free for non-commercial use, other versions start at $299 one-time-only fees. MongoBooster is a shell-centric cross-platform GUI tool for MongoDB v2.2-3.2, which provides update-in-place, fluent query builder, ES6 syntax support and true Intellisense experience. The built-in language service knows all possible completions, methods, properties, variables, keywords, even the MongoDB collection names, field names, and operators. The IntelliSense suggestions will pop up as you type. Platforms: Mac OS X, Windows, Linux Pricing: Free for non-commercial use, other versions start at $79. MongoVue is a desktop GUI for the windows platform. It has a simple clean UI and the basic features are free. Data can be presented in text view, tree view or table view. You can also save your find queries for later usage – we find this rather convenient. The more advanced features require you to purchase a license. Overall the software appears stable and well maintained. is a native Mac GUI for MongoDB. It provides you an option to connect to your MongoDB server through an SSH tunnel which is fairly convenient from a security perspective. The “StatMonitor” feature gives you a live display of stats a.k.a mongostat. The query interface is a little bit more limited in that it only seems to support a tree view. Also, there is no way to save a find query for later. In our experience, the software appears to work fairly well but it doesn’t seem like it is being maintained – so use at your own risk. An HTML-based MongoDB GUI. The GUI is authored in PHP and is open source. The downside of the HTML based approach is that you need a PHP server to run this GUI. You can also choose to run the PHP server on your local box. The UI is no frill, fairly easy to use and supports all the common options of working with collections, stats etc. The find interface only presents data in a tabular/text model – so it could be an issue when you are working with multilevel documents. Also, there doesn’t seem to be a lot of check-in activity – so we suspect the project is inactive. A shell-centric MongoDB GUI that supports the Windows, iOS, and Linux platforms. It’s still early days for RoboMongo with the latest version being 0.8.4. It is also one of the few GUI’s that supports SSL connections to your MongoDB server. There is also support for connecting through an SSH tunnel. 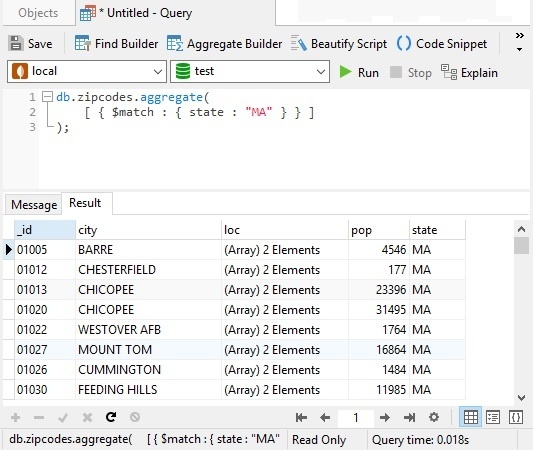 The query interface displays data in tree view, table view and text view. You can also save your queries for later usage. One of the coolest features is that it also has support for the shell – so you can still continue to use the shell commands that you are comfortable with. There are some quirks in the UI which I think will get worked out over time. If actively maintained I think this could be the best cross-platform GUI for MongoDB. Which MongoDB GUI is best? In the end, it all boils down to your requirements in terms of budget, usage needs, team members, the number of features etc. Take your pick and good luck on your journey. Build something awesome and sign up for our newsletter below, we might just feature your project! You can try out the free Community Edition of Mongo Management Studio (http://www.litixsoft.de/english/mms/). It has a simple and nice GUI and works cross platform. Whoa, this one’s def the best! MongoChef by 3T is cross-platform and compatible with MongoDB 3.0. It’s compared favourably to the others on Reddit too. For reverse schema from MongoDB, ER diagrams, query builder consider dbschema.com. Would be nice to add this tool also to the tool list on this page. You can get it done from creately diagramming tool as well. Recently I discovered a tool simply called DbSchema. First of all I was impressed because they do diagrams for MongoDB. from each collection and sub-documents in a separate window. two collections bind referencing one the other via ObjectId’s. Look for DbSchema tool, is great for the diagrams they do for MongoDB, query builder and data explorer. where you can place data in multiple collections and join it with ObjectId’s. I was surprised to see is possible to have diagrams for MongoDB as well, as for any relational database. they are a step forward in designing a database with data over multiple collections and references between them via ObjectId’s. You can give mongobooster a try. MongoBooster is a shell-centric cross-platform GUI tool for MongoDB v2.2-3.2, which provides update-in-place, Lodash & Moment.js integration, ES6 syntax support and true intellisense experience. Link: http://mongobooster.com/ . Disclaimer: I work for MongoBooster. You can give mongobooster a try. MongoBooster is a shell-centric cross-platform GUI tool for MongoDB v2.2-3.2, which provides update-in-place, Lodash & Moment.js integration, ES6 syntax support and true intellisense experience. Link: http://mongobooster.com . Disclaimer: I work for MongoBooster. MongoBooster V2 is out. This release includes fluent query builder, GUI for mongotop and mongostat, dark theme, user-defined snippets, restore last working state , auto-update and a few minor improvements. Even better now, MongoBooster, it is free for non-commercial use. Wonderful interface and features! Thanks for developing! Love it!! Hello, I’ve just released mongoclient which is writtin in meteorJS. It’s completly free and open soruce additionally supports most platforms. https://github.com/rsercano/mongoclient. Give it a shot. Every Win64 zip I have downloaded is somehow corrupt and won’t open. Hello, could you please use winrar or 7zip, default windows archiver is not allowing to unzip it. on top of a query builder, if you also want a tool that serves as admin interface, you can give https://www.humongous.io a try. Which tool is best to work with export, import, backup and restore of mongodb data across different serve. Also let me know which tool will give good options to sync data from one server to another server of mongodb (automatically). I found Studio3T more promising than MongoBooster. Really simple and very to use. Anyone else here give it a try? You can also check out QueryAssist for MongoDB (https://queryassist.com), professional GUI tool with smart code completion (IntelliSense), SQL query to MongoDB, advanced shell, themes and modern-looking GUI. Free version is available.